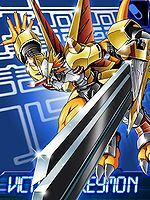 A subspecies of War Greymon, whose body is clad in armor of the super-metal "Chrome Digizoid", it easily wields its gigantic sword, and is the "Dragon Warrior of Heroes" that fights against its opponents with unique sword techniques. 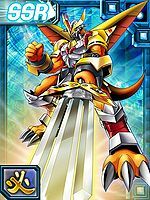 Its Special Moves are wielding its gigantic crushing sword "Dramon Breaker" to perform a heroic sword technique in which it strikes the opponent, instead of slashing, pulverizing them (Dramon Breaker), and splits the Dramon Breaker and equipping the pieces to its arms, taking all the energy within the atmosphere and concentrating it into the tips of its sword, then firing it (Trident Gaia). 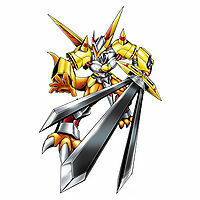 Also, it has a unique sword technique named "Victory Charge" which allows it to reflect back an opponent's attack with its gigantic sword. 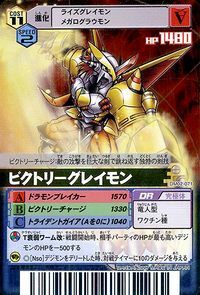 In addition, Victory Greymon possesses an evolutionary code that differs from Digimon that were naturally born in the Digital World, and it is thought that it is a Digimon that evolved from a Digitama that was produced due to artificial data intervention. 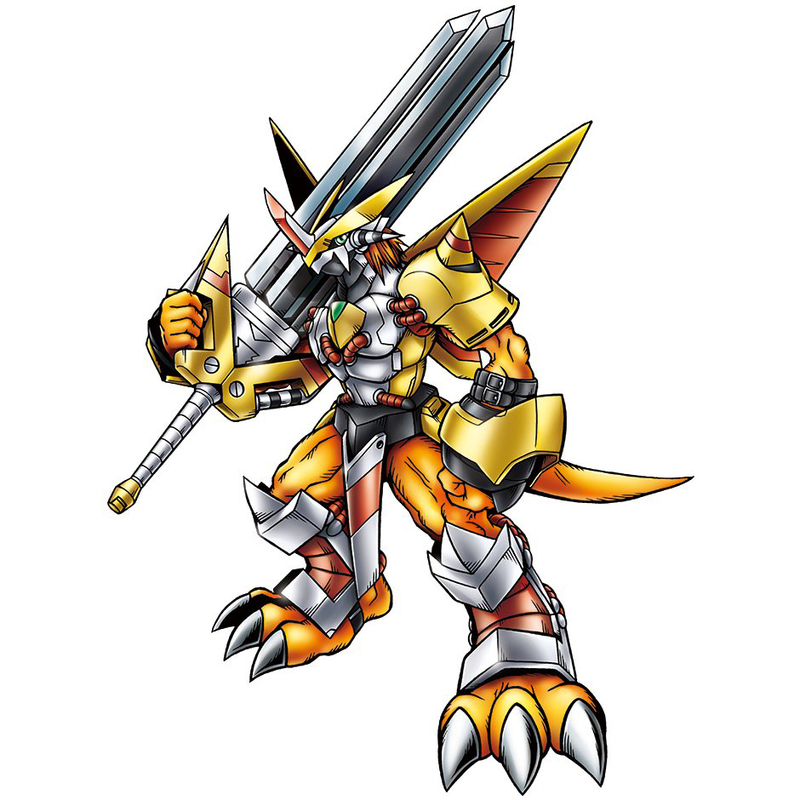 A subspecies of War Greymon, whose body is clad in armor of the super-metal "Chrome Digizoid", it easily wields its gigantic sword, and is the "Dragon Warrior of Heroes" that fights against its opponents with unique sword techniques. 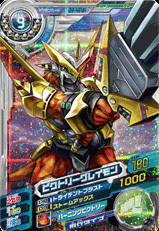 Its Special Moves are wielding its gigantic crushing sword "Dramon Breaker" to perform a heroic sword technique in which it strikes the opponent, instead of slashing, pulverizing them (Dramon Breaker), and splits the Dramon Breaker and equipping the pieces to its arms, taking all the energy within the atmosphere and concentrating it into the tips of its sword, then firing it (Trident Gaia). 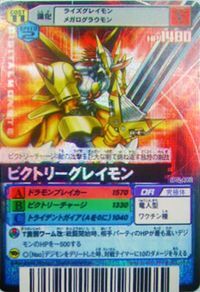 Also, it has a unique sword technique named "Victory Charge" which allows it to reflect back an opponent's attack with its gigantic sword. 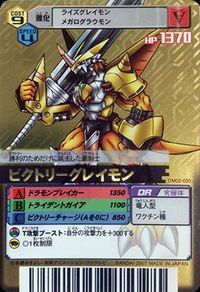 A subspecies of War Greymon, whose body is clad in armor of the super-metal "Chrome Digizoid", it easily wields its gigantic sword, and is the "Dragon Warrior of Heroes" that fights against its opponents with unique sword techniques. Title: 「豪傑の竜戦士」 — "Dragon Warrior of Heroes"
1) n., Success in a struggle against difficulties or an obstacle. 2) n., One who defeats an adversary; the winner in a fight, battle, contest, or struggle; synonymous to "victor". 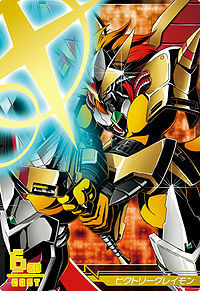 Anime/Manga Digimon Next: "Paired Sacred Devices - Digimon Twin!" 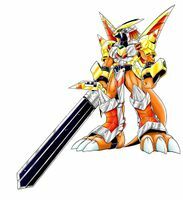 Releases a concentration of atmospheric energies from the two modular components of the Dramon Breaker installed onto its armor's gaunlets. Uses the Dramon Breaker to defend against attack. 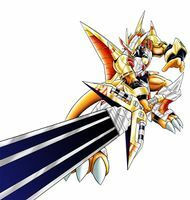 Assembles the Dramon Breaker broadsword and attacks. Is the partner of Tatsuno Tsurugi. 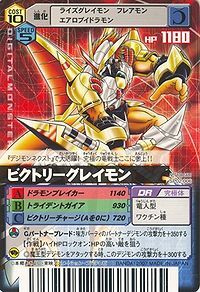 Evolves from Rize Greymon or Metal Greymon at 30 battles, with 50% won and 2 egg reverts. 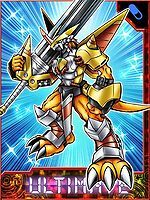 Evolves from War Greymon by Card Evolution. 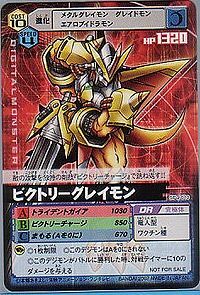 Victory Greymon is an available Side Evolution for WarGreymon. It can be unlocked if level 65 or above with the item Dramon Breaker. 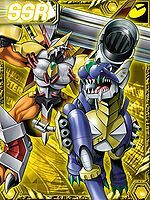 Victory Greymon is an obtainable Digimon which is evolved from Metal Greymon or Rize Greymon. It can also be obtained as a collectible card. 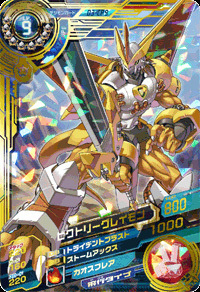 Its card is part of the Ultimate Greymon (究極体グレイモン Kyūkyokutai Gureimon) set. 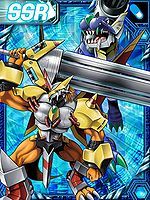 Victory Greymon is available as a Digimon Medal. A great swordsman born solely to attain victory. 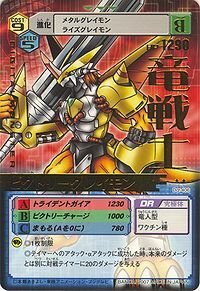 Victory Charge: A unique sword technique which allows it to reflect an opponent's attack with its gigantic sword. 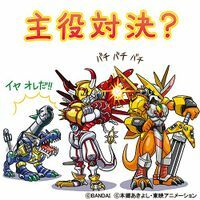 It plays a huge role in "Digimon Next"! The ultimate dragon warrior makes its appearance!! A subspecies of War Greymon, it possesses a huge sword and is clad in armor made of a super metal known as "Chrome Digizoid". 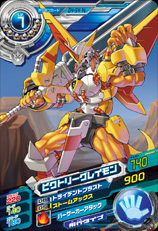 This Dragon Man Digimon is able to swing its large, destructive sword "Dramon Breaker" effortlessly, and can dish out various spirited sword techniques. 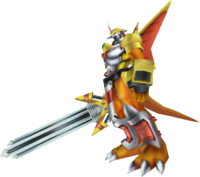 A heroic Digimon also referred to as the "Dragon Warrior of Heroes". It is considered to have been born through the intervention of artificial data. 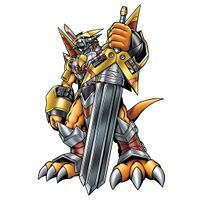 A subspecies of War Greymon, this heroic dragon warrior is armed with its giant crushing sword, the Dramon Breaker. It is well-learned in a unique style of swordplay, where instead of slicing the enemy, it strikes and crushes them to pieces instead. 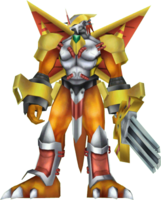 Victory Greymon is the boss Digimon in the Round X of the arcade game's first version. 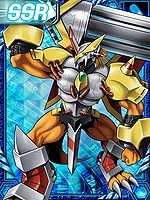 ↑ Digimon Next - "Digital World!"